A Holiday Spectacular for the Whole Family! For conductor Stuart Chafetz, who is leading Seattle Symphony’s Holiday Pops concerts this December, the holidays bring back memories of the time spent in high school going into the hustle and bustle of the city to sing Christmas carols, and returning home to continue the party, singing and eating. The Seattle Symphony invites you to a hometown holiday spectacular complete with your favorite carols, a dancing Santa and some unique musical treats from world-class soloists, the Seattle Symphony and local entertainers. 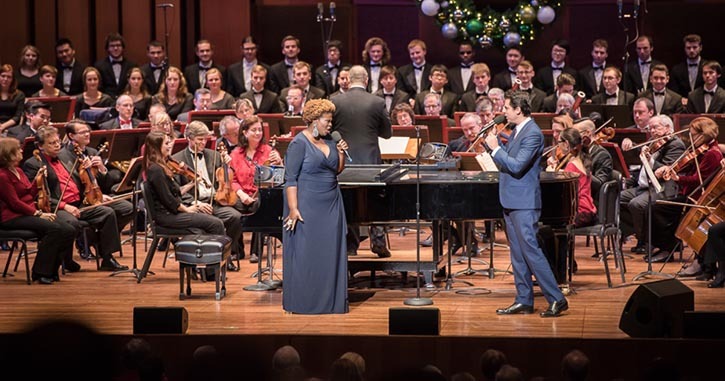 Headlining these concerts are jazz vocalist and pianist Tony DeSare and Broadway diva Capathia Jenkins. DeSare has three top ten Billboard jazz albums under his belt and has been featured on the CBS Early Show, NPR, A Prairie Home Companion and the Today Show. Jenkins is most recently known for starring in Disney’s production of Newsies on Broadway, in which she originated the role of Medda, and can be heard on the film soundtracks for Nine, Chicago and Legally Blonde 2. With familiar favorites and a few surprises, this is truly a joyous family affair. From “Jingle Bells” and “Santa Claus is Coming to Town” to “O Come, all ye Faithful” and “O Holy Night,” there’s something to please everyone in the group. Chafetz put it best when he said, "I think people go to Symphony concerts expecting to hear beautiful music and to be moved emotionally, which they’re going to be, but it will also be fun and they’ll hear fantastic, jovial music. They’ll come out with a renewed sense of holiday spirit, whistling their favorite tune." Come join us for Holiday Pops and make a new family tradition for the holidays at the Seattle Symphony!